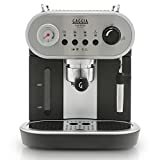 Currently viewing the category: "Semi-automatic Espresso Machines"
Gaggia is well known for making the best entry-level semi automatic espresso machines for home use. 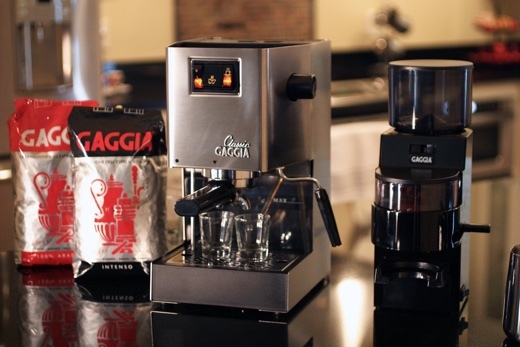 The Gaggia Classic is a favorite among home baristas, and is has been for many years. It’s a classic machine, alright! Another great choice for a home machine is the Gaggia Carezza Deluxe, which is the subject of this post. It’s a close competitor to the Classic, but just how close (or far apart) are they in terms of features? And which would make a better choice? Pressurized portafilter can extract ground coffee or ESE pods. Pre-infusion functions wets the coffee ground before extraction to ensure full saturation and an even extraction. Pannarello steam wand which doubles as a hot water dispenser. Water reservoir located at the front of the machine with a visible window for water level inspection. 47 oz capacity. Heat up time is around 1 minute. Controls: buttons and a dial knob for steam. Housing: stainless steel with plastic. 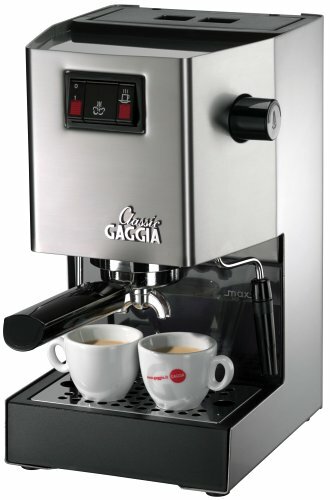 Click here to learn more about the Gaggia Carezza Deluxe, read the customer reviews and buy it. Commercial style stainless steel espresso maker. Commercial 58mm portafilter. Can be used with pressurized baskets, too. Pannarello steam wand doubles as a hot water dispenser. Controls: switch buttons and knob for steam. Water reservoir capacity: 72 oz. 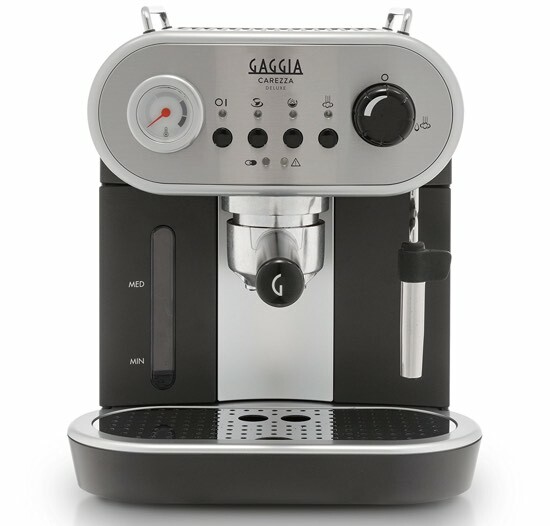 Click here to learn more about the Gaggia Classic, read the customer reviews and buy it. Gaggia Carezza Deluxe vs. Classic, What’s The Difference? The Gaggia Carezza has a pressurized portafilter, while the Classic model gives you the option of using either a pressurized basket or non-pressurized. With a pressurized basket (the basket with a screen filter), the machine forces the coffee grounds into those tiny holes, the water usually stays in contact with the coffee longer before the coffee comes out. The Pressurization is what usually makes the crema on top of the espresso shot. This type of filter is a great option for beginners with moderate grinders, because in this case, the precision of the grind isn’t as important (it still has to be fine ground, though). With a non-pressurized filter, the quality of the shot is all on you. The coffee grind has to be precisely right, the contact time has to be perfect and any inconsistency will definitely result in a bad shot. The Carezza combines stainless steel with plastic. But the body is mostly plastic. The Classic is mostly stainless steel with few plastic parts. We actually prefer the quality of the Classic way over the Carezza Deluxe. It’s a commercial-style espresso maker but made to accommodate the home user without any complications. With the Classic, you have the option of using a pressurized or non-pressurized basket, so you have the option for an easy shot extraction with room to practice the use of non-pressurized shots. The built of it, stainless steel housing, makes it a more durable machine. The only problem with the Gaggia Classic over the Carezza Deluxe is that it takes longer to heat up, up to 5 minutes, but that’s because it’s a more powerful machine, so that’s understandable. 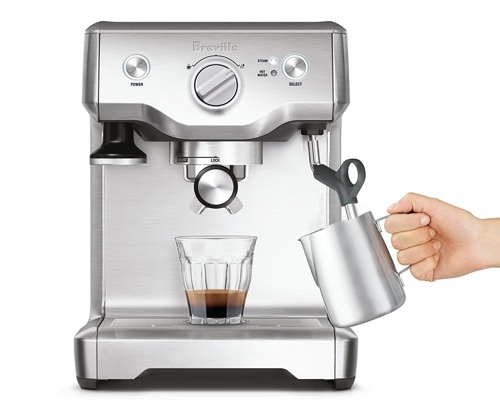 Breville espresso machines are known for their sleek and precise design. They’re packed with features, have superior quality and are available in a range that works for both beginner or intermediate and professional espresso machine users. In previous posts, we’ve looked at machines like the Breville Infuser and Barista Express and have compare them to each other. In this post, we’ll look at the Beville Duo-Temp Pro, its features and how it compares to other Breville espresso machines. 1600W thermocoil stainless steel heater that accurately controls water temperature. Auto purge function automatically adjusts water temperature after steam use. Pre-infusion function applies low water pressure to the coffee ground to expand it before extraction. Electronic PID control for increased temperature stability. 61 oz removable water reservoir. Hot water can be dispensed through the frothing wand for making Americanos or for pre-heating cups. 54mm portafilter with 4 filter baskets. 16 oz stainless steel frothing jug. Water filter holder and a replaceable filter. 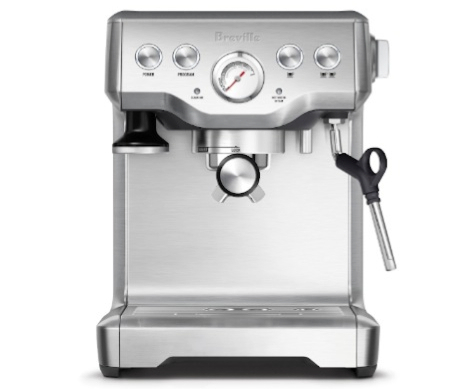 Click here to learn more about the Breville Duo-Temp Pro, read the customer reviews and buy it. On the Infuser, there are two programmable buttons for a single or double shot. You can reprogram the volume metric for these buttons for automatic extraction. On the Duo-Temp Pro, there’s just one selector button for Steam or Hot Water, and then with the dial knob you can either choose to extract, froth or dispense water. Speaking of dispensing water, the Infuser has an independent spout for dispensing hot water. While the Duo-Temp Pro uses the frothing wand for dispensing water. On the Infuser, you’ll see there’s a gauge on the middle of the front panel that allows you to monitor the pressure of the machine. The Duo-Temp Pro doesn’t have this gauge. The Infuser is available in 3 colors. All other features like water tank capacity, accessories, power and pump are the same. 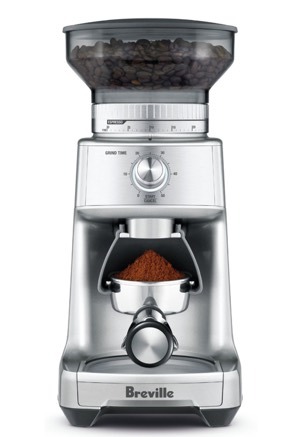 It has a built-in stainless steel conical burr grinder with a sealed bean hopper. It has a 67 oz water reservoir, so it’s larger than both the Duo Temp Pro and The Infuser. It has a portafilter cradle that allows for hands-free automatic grinding. On its control panel, you’ll find: grind amount selector, single/double shot buttons, program button, filter size selector, pressure gauge. Like The Infuser, it has a dedicated hot water dispenser. The Barista Express is available in 3 colors. 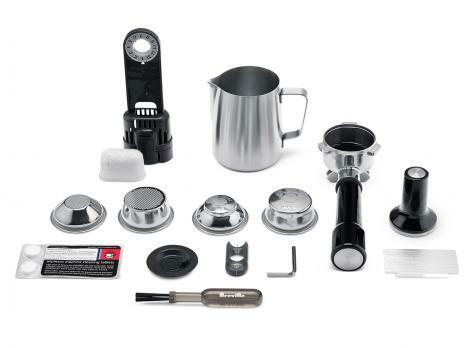 Like the other Breville Espresso machines, it comes included with all accessories: cleaning kit, portafilter with 4 baskets, water filtration, frothing jug. 72 oz water reservoir, so it’s notably larger than the 62 oz Duo-Temp Pro reservoir. The controls on the Classic are switch buttons. On the Duo-Temp Pro the controls are LED backlit press buttons. It has a chrome-plated brass portafilter and brew head, which gives you more temperature stability over your shot. It has a 58mm portafilter, which is bigger than Breville’s 54mm portafilter. The Classic has a 17 1/2 bar pump pressure. 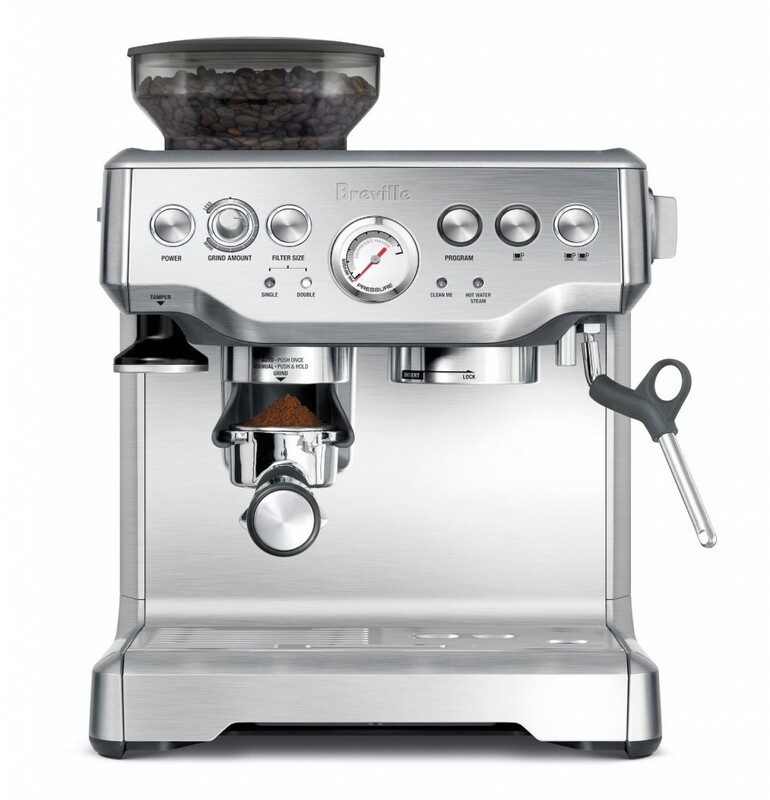 While the Duo-Temp Pro (and other Breville espresso makers) has the standard 15 bar pressure. The Classic includes: single/double filter baskets, measuring scoop and coffee tamper. You’ll have to buy a frothing jug separately. Which Of These Espresso Machines Should You Buy? When it comes to choosing the right espresso machine for you, it is very important to know exactly what you’re looking for. More expensive doesn’t always translate to the best choice, a bigger or more advanced espresso maker could be great but it can also have features that you might not need, so in a case like this, you could save some money to put towards another thing for your at-home coffee bar. 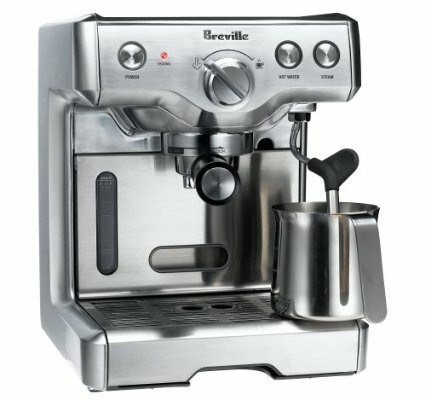 If you don’t need programmability and automatic brewing, then either the Breville Duo Temp Pro or Gaggia Classic would be an excellent choice that will save you around $100 to $150 or even $300 ( in comparison to the more advanced Barista Express or Infuser) that you could put towards a decent conical burr grinder for example. If you prefer an all in one solution instead of buying separate gadgets, the Breville Barista Express would make an excellent choice. You’ll have everything you need right out of the box. And although it looks complicated to use, it isn’t. It has automatic as well as manual, so you have room to learn and grown your barista skills. Overall, the Breville machines give you great value for your money thanks to their great quality and the great bundle of accessories included with every machine. DeLonghi Dedica vs. Gaggia Classic: Which One Should You Choose? We’ve mentioned both the DeLonghi Dedica EC680 and Gaggia Classic as two great choices for a beginner’s first espresso maker. We know that many will disagree with us on this, these two espresso makers are not the cheapest and not the easiest to use. So on what basis did we decide to recommend them for a beginner? Perfecting a shot of espresso isn’t an easy task, it takes some practice until you get the ratio and timing right. The DeLonghi Dedica and Gaggia Classic will help you develop your skills, you get to really control your espresso shots manually or automatically. They’re not the type of espresso makers that you’ll use for a few months and then outgrow, these models will last you a long time before the need to upgrade. And that’s why we recommend them as your first machines! Very slim design, takes about 6″ of counterspace. Quick 40 seconds start up time. Pre-set espresso measurement, all can be re-set to your taste. Can be used with manual options too. Water reservoir capacity: 1 liter. espresso maker with 17 1/2 bars pressure pump. 72 oz water reservoir capacity (about 2 liters). Brass portafilter and grouphead to help stabilize temperature. Frothing wand doubles as a hot water dispenser. What Is The Difference Between the DeLonghi Dedica EC680M vs. Gaggia Classic? The Dedica has a 15 bar pump pressure which is standard for most espresso makers. The Gaggia Classic has a 17 1/2 bar pump pressure. The Dedica has a 1 liter water tank capacity. The Gaggia Classic has a 2 liter capacity. The Dedica is quite compact with only 6-inches in width. The Gaggia is about 8 inches wide. The Dedica has both automatic and manual options. It’s overall easier to use than the Gaggia Classic. The Gaggia Classic is only manually operated. Using the switch buttons, you’ll have to manually start and stop the shot. This is harder to do, but it’s good practice. If you’re looking for a fool-proof way to create delicious coffee drinks, you’ll love using the DeLonghi Dedica. Its preset and programmability give you room to quickly make your drink, and if you’re ever in the mood for an espresso brewing lesson, you can use the manual settings. On the other hand, if you’re serious about your espresso brewing skills, you’ll want the Gaggia Classic for sure. It’s a commercial grade machine designed with the home user in mind, and it is able to produce a better shot due to its temperature stability. 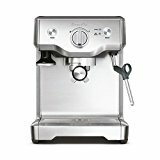 What Is The Best Espresso/Latte Bar Setup Under $500 For Home? Having your own espresso bar at home, you’ll be making your own delicious espresso and coffee drinks how you want and when you want. It’s not only fun, but it will save you a whole lot of money (no more trips to expensive coffee shops). To be honest, if you’re looking for the best gear out there, then $500 is not considered to be a high budget. However, we can absolutely work with it. Your budget will go on an espresso machine and a conical burr grinder. The grind and consistency of your coffee will make all the difference in the quality of your espresso, so it’s important not to skip the grinder. Below, we’ll list a number of espresso makers and conical burr grinders with a sum price of $500 or less. Please note that these prices can change by their sellers which we have no hand in, but we do our best to find you products at these prices. This is a favorite among many people, because for its price, this is a top-notch espresso maker. Gaggia is an Italian brand well-known for its high quality. The Classic is a manual machine that will allow you to practice barista skills with ease. 17 1/2 bar pump pressure. Brass portafilter and grouphead for temperature stability. Frothing wand and hot water dispenser. 75 oz water reservoir with a front window that shows the level of water. Auto-purge function adjust water temperature after steam for the best espresso extraction temperature. Triple Prime function releases 3 bursts of hot water to wet the coffee ground for an even extraction and full flavor. Dial knob allows you to select from espresso, steam or hot water. Breville 800ESXL vs. BES840XL Comparison. Click here to learn more about the Breville Triple Priming Espresso Machine, read the customer reviews and buy it. This espresso maker by DeLonghi is exceptionally slim in width, but don’t be fooled by its size, you can use it to make fantastic coffee drinks. Only 6-inch wide, doesn’t take a lot of counterspace. Quick 40-seconds heat up time. Cappuccino frothing system for a delicious and creamy froth. Can be used manually, too. 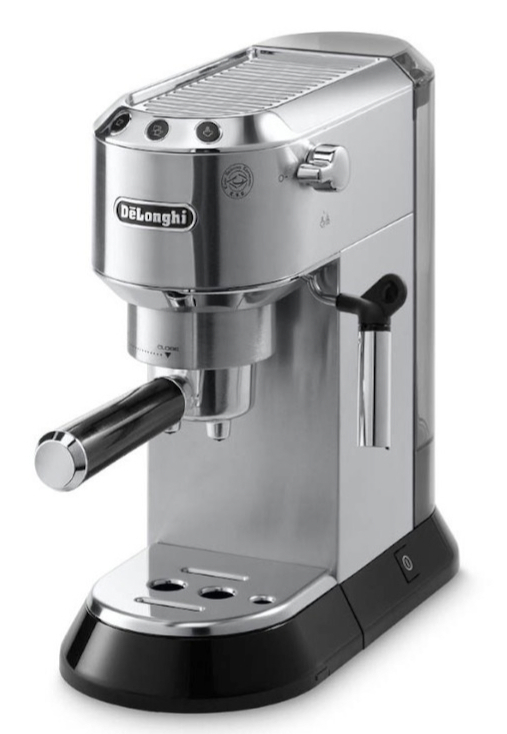 Click here to learn more about DeLonghi Dedica, read the customer reviews and buy it. The Bodum Bistro is a mid-range conical burr grinder that gives you many decent features for its price range. Choose from 14 grind settings from fine to coarse. Timed grind setting allows you to set a timer for your grind. 11 oz coffee ground container. 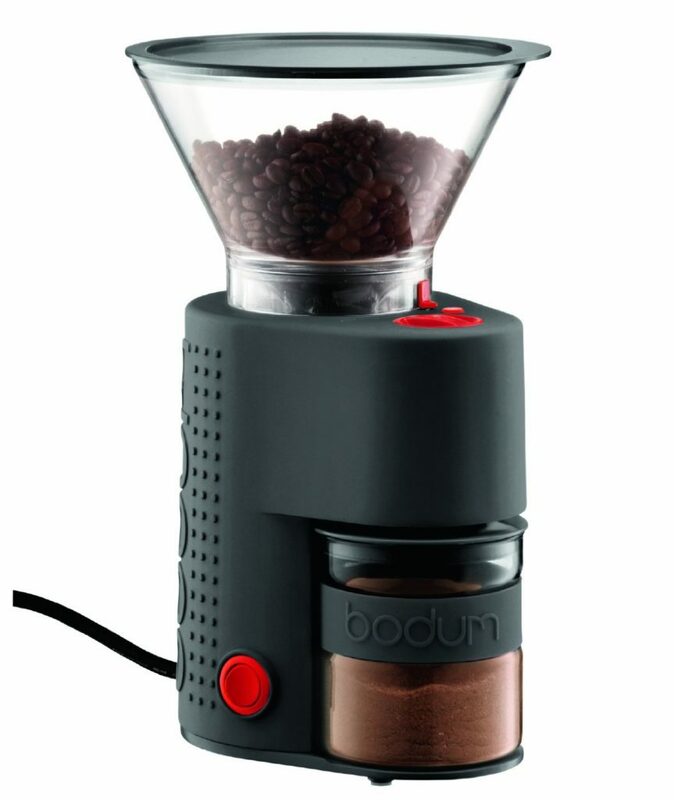 Click here to learn more about the Bodum Bistro Electric grinder, read the customer reviews and buy it. 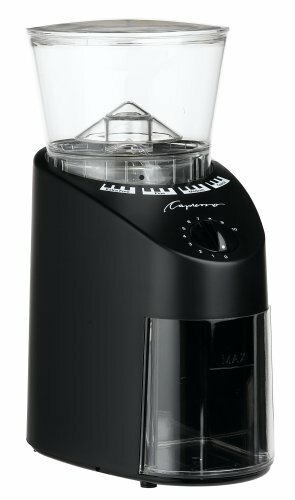 The Capresso Infinity is somewhat similar to Bodum’s Bistro with some slight differences. For example it has 16 settings instead of 14, which isn’t huge, but can make some difference in the result of your preferred coffee method. 16 grind settings from coarse to fine. 8 1/2 ounces bean hopper capacity. 4 oz coffee ground container. Available in plastic housing or die-cast housing. Click here to learn more about the Capresso Infinity, read the customer reviews and buy it. Choose from 60 precise grind settings. Built-in timer allows you to choose from increments as little as 1 second. 12 oz bean hopper capacity. Holder allows you to grind directly into a portafilter, gold-tone filter or coffee container. Click here to learn more about the Breville Dose Control Pro Grinder, read the customer reviews and buy it. 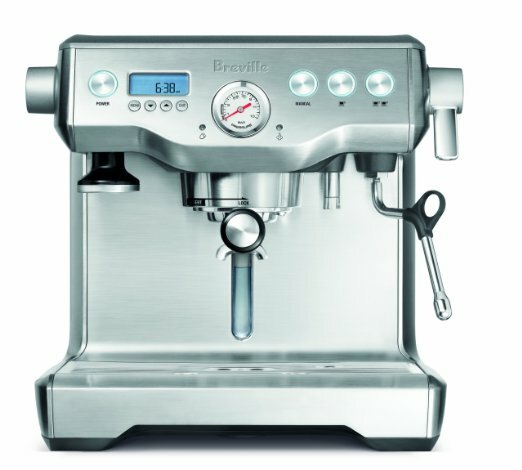 Thoughts On Breville Barista Express, Is It Worth It? 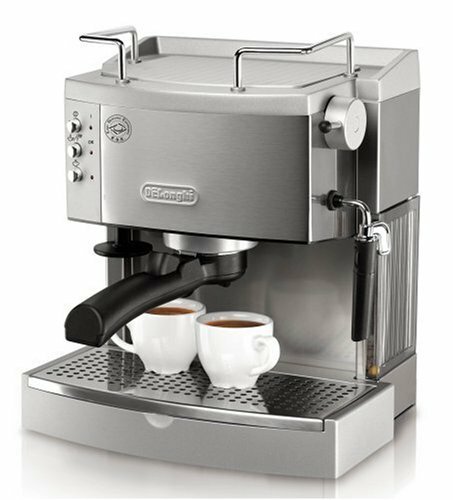 Breville’s Barista Express espresso machine has been one of the best selling espresso maker through our website for a while. In this post, we’ll give our thoughts on the machine, why it’s worth your money and if you should buy it or not. Is The Barista Express Worth The Money? Should You Buy the Barista Express? 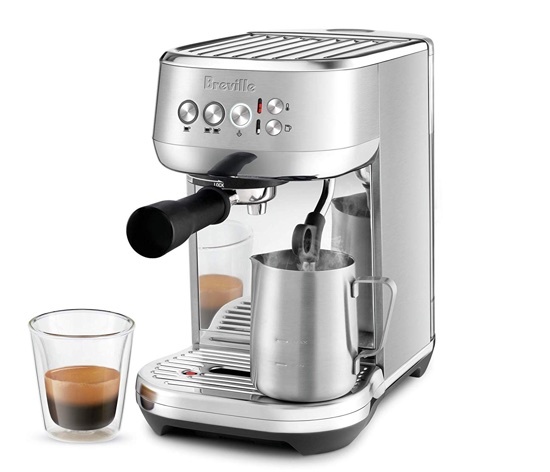 What Is The Breville Barista Express and How Does It Work? The Barista Express is a semi-automatic espresso machine that has an integrated conical burr grinder. The grinder grinds only the amount of coffee you need right into the portafilter, so your coffee is extracted only seconds after grinding, giving you a truly aromatic shot of espresso. The Barista Express has the ability to work automatically with pre-set shot volumes, as well as manually. All pre-sets can be reprogrammed to your preference. The grinder on the Barista Express has a dial where you can adjust your grind and a Grind Amount dial dose the amount of grind to suit the grind size. 1600 watts thermocoil heating system. Electronic water temperature control for temperature stability. Purge function automatically adjusts water temperature after steam use for the best results. Pre-infusion function applies low pressure water to coffee ground at the start to allow for an even espresso extraction. Portafilter includes stainless steel baskets for a single or double shot. Removable 67 oz water reservoir. Hands-free cradle holds the portafilter when grinding directly into it. Bean hopper capacity: Half a pound. Water filter and water filter holder. 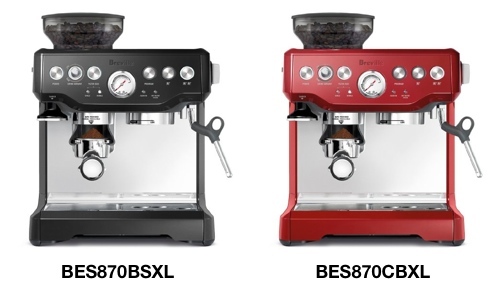 The Barista Express is available under two model names: BES870XL and BES860XL. It is also available under variations BES870CBXL and BES870BSXL. Wondering what’s the difference between them? The BES860XL is an older version, therefor slightly less expensive, where the BES870XL is the latest version of the Barista Express. The BES870XL has more power, 1600 watts compared to BES860XL’s 1450 watts. It has a redesigned bean hopper. The BES870XL has a hot water dispenser and it has an auto-off option that the BES860XL lacks. Lastly, the BES870XL gives you better control of coffee and water temperature. As for the names BES870CBXL and BES870BSXL, these simply refer to the colors the BES870XL available in. The added CB refers to Cranberry, which is the deep red version and the BS refers to Black Sesame which is the Black version. 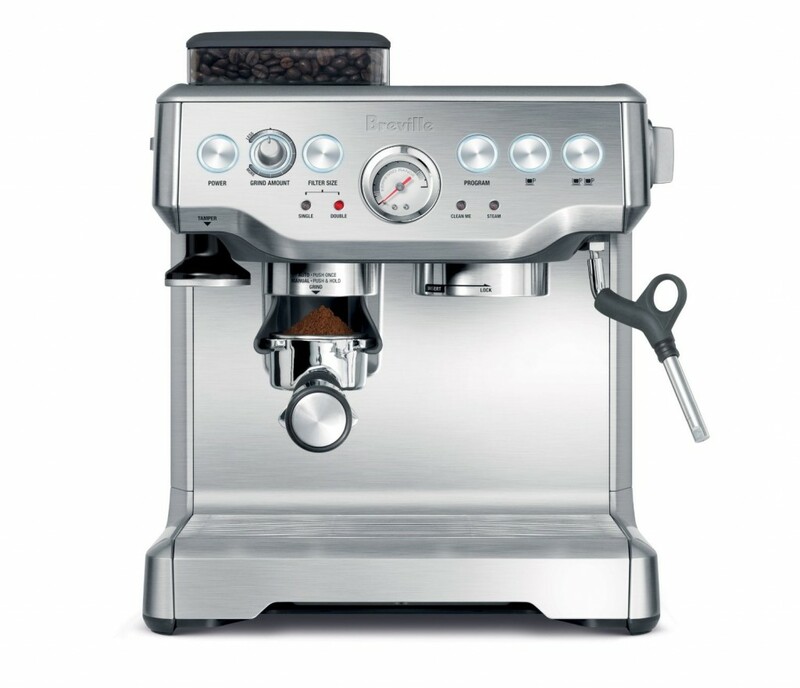 The Barista Express BES860XL is only available in Stainless Steel. As the Barista Express is at a range of $500 to $600, some might wonder if it’s worth your price. a high quality, nicely built espresso maker. a high quality conical burr grinder. All necessary accessories like a frothing jug, tamper and more. If you do the math, you’ll find that the Barista Express is a cost-efficient purchase that includes everything you need in one unit. The Barista Express is made of high-quality parts, stainless steel housing that is easy to maintain and clean, and it has storage within it for all its accessories like portafilter, cleaning tools and such. So for what’s included with the machine, as well as the machine itself, it is absolutely worth the price. Who Should Buy The Barista Express? This machine is perfect for beginners as well as intermediate at-home baristas. For a beginner, it could be tricky to use at first, but it’s a great learning tool and you should be able to get it right in no time. And there’s always the automatic option where the machine can do it for you if you can’t. While some might advice beginners to start with a small and easy to use espresso maker, we advice against this. It’s better that you pay more for something that will last you for a long time than spend less money on a machine that you will outgrow soon enough. So why not invest in a proper espresso maker that you won’t get bored of or have to replace soon after. Which Espresso Maker Is Best For Cappuccino? Is Cappuccino your favorite coffee drink? 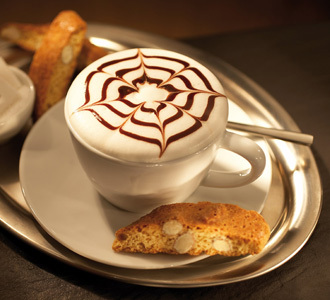 Are you looking to purchase an espresso maker mainly for making delicious frothy Cappuccinos? While all espresso makers can make Cappuccinos, some makers make the task easier than others, especially for beginners. In this post, we’ll highlight the best espresso makers for creating the perfect cup of Cappuccino. 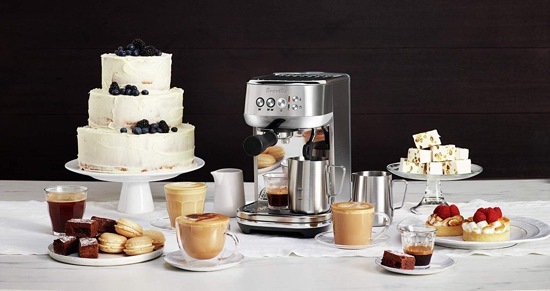 The Nespresso CitiZ is the perfect Nespresso for creating your favorite coffee drinks, Cappuccino or Lattes. Simply insert a coffee capsule, push a button and watch your coffee brew. With the built-in milk frother, you’ll be able to make hot or cold milk froth for your Cappuccino in about a minute. Click here to read our review and learn more about Nespresso CitiZ. The DeLonghi Lattissima Pro takes automation to another more advanced level. Also powered by Nespresso, simply insert a capsule, choose your drink from the menu on the LCD display and hit brew, the machine will do everything for you. This automatic espresso and cappuccino maker comes from Keurig and is powered by Lavazza, the famous Italian coffee brand. The machine uses espresso pods made by Lavazza, and with a touch of a button, you can choose from Cappuccino, Latte, Machiatto or Espresso and let the machine do the rest. 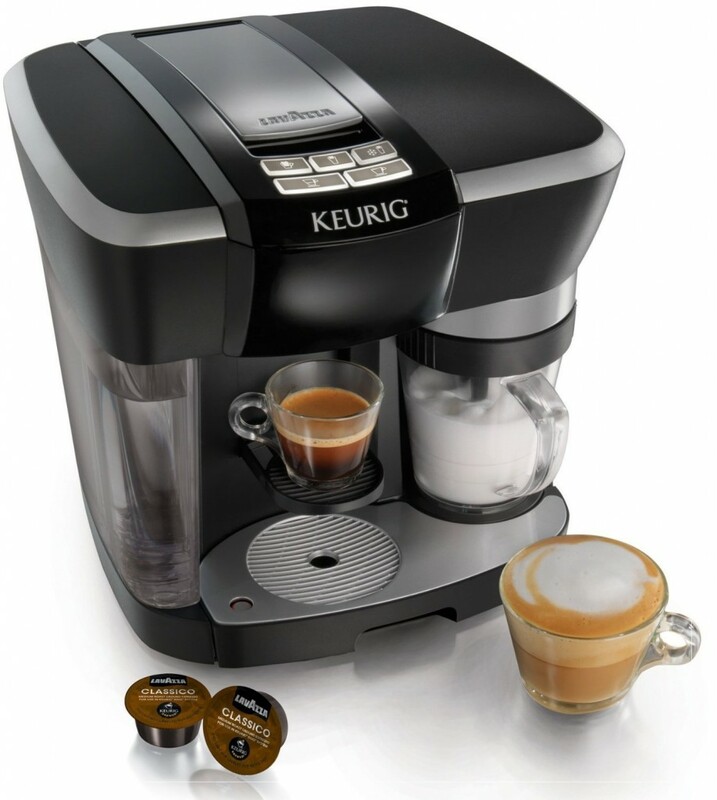 Click here to learn more about Keurig Rivo Coffee system. If you’re not a fan of using espresso capsules, the Mr. Coffee Cafe Barista gives you the automation of the previous machines with the ability to use ground coffee. Using the buttons on the control panel, choose your preferred drink and you’re set! Click here to learn more about Mr Coffee Cafe Barista. The DeLonghi EC702 is a classic espresso maker perfect for making your daily dose of Cappuccino. It’s a manual machine made with the home user in mind, so it’s not complicated to operate. The milk frother is simply to use and creates the perfect froth. 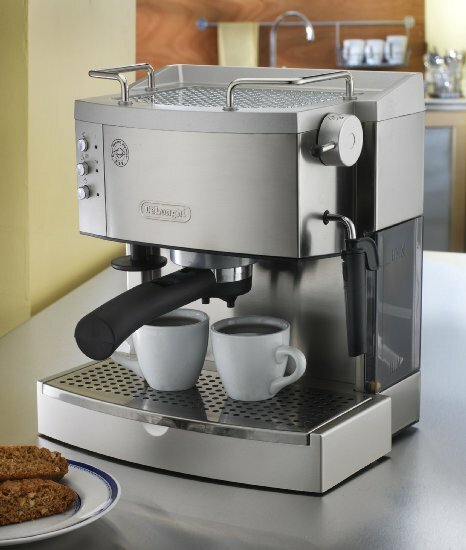 Click here to learn more about the DeLonghi EC702. The Dedica, also by DeLonghi, is a semi-automatic espresso maker. It features automatic flow stop, so you’ll get the perfect measure of espresso for your cappuccino, you can also reprogram it to your taste. The frothing wand is stainless steel, which gives you a better froth and it’s easier to clean. It is also worth mentioning that this is the slimmest espresso maker you can find, taking only 6″ of countertop. Click here to learn more about the DeLonghi Dedica. The DeLonghi Gran Dama Avant features a built-in conical burr grinder, detachable milk frother, touch buttons and a backlit LCD display. Everything on the machine is programmable and customizable. Choose your coffee strength, cup size, the amount of milk, the type of grind and the machine will memorize your options and saves them. It is also one of very few espresso maker that are able to make drip coffee. 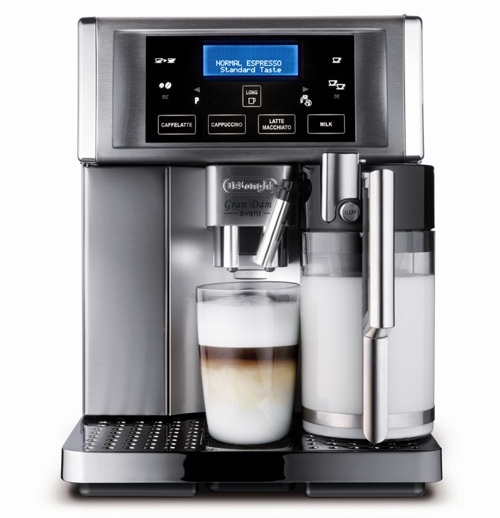 Click here to learn more about the DeLonghi Gran Dama Avant. Best Nespresso machine for Cappuccino. Automatic Cappuccino Makers for under $300. Best Cappuccino and Lattes Makers for Home Use. Which Espresso Maker Is Best For a Beginner? Pulling the perfect shot of espresso at home can be an intimidating thing, especially if you’re just starting out. But like everything else in life, practice makes perfect, and you can certainly turn into a home barista in no time! A quality espresso maker that is easy to use, but has enough features for you to develop your skills. A machine that you won’t find dispensable even after you’ve developed your espresso making skills. A beginner’s espresso maker isn’t necessarily the cheapest, many people fall into the trap of buying a cheap espresso maker to learn with and then find themselves in the need of a new one shortly after. That is definitely a waste of money. There are a number of affordable yet durable espresso machines that you can learn on and keep for the long run. It has automatic as well as manual flow, which means you can either use the pre-set shots or create your own. The machine will remember your last shot preference. It’s very compact in size, it will not take much counter space. A swivel steam frother will allow you to practice your milk frothing and try your latte art skills. Thermoblock technology allows the machine to heat up in less than 40 seconds. Beautiful Italian design. Stainless steel exterior. Read our full review on the DeLonghi Dedica here. It has a mixture of automatic and manual functions. Use either one to create your espresso shots. Pre-fusion function makes sure the coffee ground is saturated with low pressure water before brewing. This ensures a great shot every time. Auto-purse function automatically adjusts water pressure for you after steam use for the best espresso extraction temperature. The steam gauge on the front panel guides you on when and what task the machine is ready to perform. Also features a hot water dispenser, perfect for Americano or any other beverage preparation. Read our full review on Breville The Infuser here. Simple to use, with manual operation. A more affordable option, if you’re on a budget. Stainless steel exterior makes it a durable machine to have. We listed both these espresso makers as a great choice for beginners, however, the Breville Infuser actually has way more features than the Dedica, that it will still make a suitable machine even when your skills have evolved. The Breville Infuser is bigger in size, therefore has a larger water reservoir. It has a PID technology that regulates the temperature, so you can expect more consistent results. It has a gauge that allows you to easily monitor the pressure of the machine so you know when to extract your espresso or steam your milk. And one of the greatest features of the Infuser is its pre-infusion which saturates the coffee ground before extraction, which ensures an evenly extracted coffee. The Dedica’s biggest feature is its small size. With only 6″ width, it’s a great choice for anyone with little counter-space to spare. It has 1300 Watts power, which is less than the Breville’s Infuser 1600 Watts, but it’s a great wattage for its size. Dedica’s portafilter is 51mm, which is smaller than Breville’s 54mm portafilter. So, overall, you’ll pretty much be able to do the same using both espresso makers. 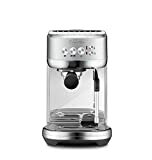 But the Breville Infuser regulates heat better, pre-infuses coffee ground which results in better tasting coffee and with its auto-purge function that brings down the temperature of the boiler after using the steamer to ensure your espresso is extracted at an optimal temperature. DeLonghi Dedica vs. Gaggia Classic, Which One To Choose? The Gaggia Classic isn’t necessarily a beginner’s espresso maker, but if you have the patience, you’ll enjoy using and developing your barista skills using it. How does it compare to the DeLonghi Dedica though.. It is 17 1/2 pressure bar, stronger than the Dedica’s 15 bars. It is fully manual, so you’ll have to know when to start and stop pulling your shot. It has a generous 72-oz water reservoir and a hot water dispenser. The biggest difference here is that the Gaggia Classic is a manual machine with no programmability at all. This is important to keep in mind, as it will take a lot of practice until you’re able to produce a great shot of espresso. Should You Buy DeLonghi EC702 or DeLonghi EC680? If you want a high quality, yet affordable espresso machine, then Gaggia is the name to go for. The Italian made machines start at $200 only, making them an affordable option for many people. 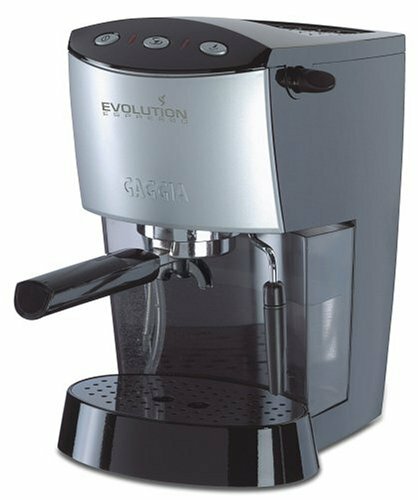 So far on our website, we’ve covered many Gaggia machines, and in this post, we add another one, the Gaggia Evolution. We’ll also be comparing it to a few other Gaggia machines of the same class and price range. 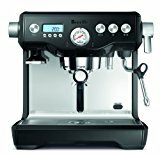 15 bar espresso machine with commercial style group-head. Turbo frothing wand for the best froth results. Single and Double gaskets included. Can also use e.s.e pods. Three control buttons: power, brew and steam. 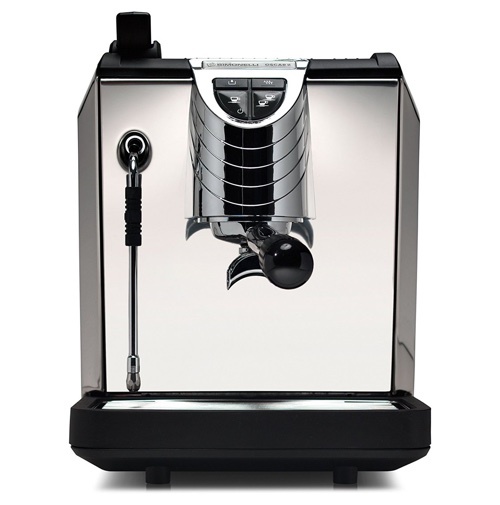 Click here to learn more about this espresso machine, read the customer reviews and buy it. It is superior in quality, with a full brushed stainless steel housing. It has a larger water reservoir, 72 oz. It has higher pressure, 17 1/2 bar, which extracts more flavor. Click here to read our review of the Gaggia Classic. Apart from those two points, we don’t see major difference between the two machines and it might not be worth the upgrade over the Evolution. Click here to read our review of the Gaggia New Baby. 1100 Watts voltage, it is lower than all machines above. 42 oz water reservoir – smaller than the Evolution. The Gaggia Pure isn’t highly recommended over the Evolution or other Gaggia machine. It is outdated and is almost only available as refurbished or used. Also, due to its lower voltage, we would recommend the Evolution over it. Click here to learn more about the Gaggia Pure, read customer reviews and buy it.